The Christmas of 1938 must have been a rather tense one. The Munich agreement had been signed three months before, but Europe was sliding inexorably towards crisis and within a year it would be engulfed by war. John Holroyd-Reece, at that point effectively the Managing Director of Albatross Books in Paris, may have had more to fear than most. The business of Albatross, selling English language books throughout Continental Europe, depended on peace in Europe, and his personal situation was both very European and very exposed to the risk of a war between Britain and Germany. He had been born and brought up in Munich as Johann Hermann Riess, to a German Jewish father and English mother, had opted for British nationality and anglicised his name, was now living in France and his (second) wife Jeanne was Belgian. But despite the difficult political situation, he had a lot to celebrate. He was living in a magnificent apartment on the Ile de la Cité, one of the most prestigious areas of Paris, in the shadow of Notre Dame, in a building shared with the offices of the firm. Business was going well, publishing not only Albatross Books, but also the long-established series of Tauchnitz Editions, which they had effectively taken control of 4 years before. So when he decided to send out a Christmas card, it was never likely to be a simple nativity scene or a cute picture of snow, robins and holly. He commissioned an artist to produce it and ended up with an astonishing card, almost 4 metres long and folded concertina style into a 30 page booklet featuring images from their home and office. The artist was Gunter Böhmer, then 27 years old, but who was to go on to become a significant artist across a range of styles. He was born in Dresden in Germany, had studied in Italy, and had worked at Officina Bodoni in Verona with Giovanni Mardersteig, who had created the book design for the Albatross series. 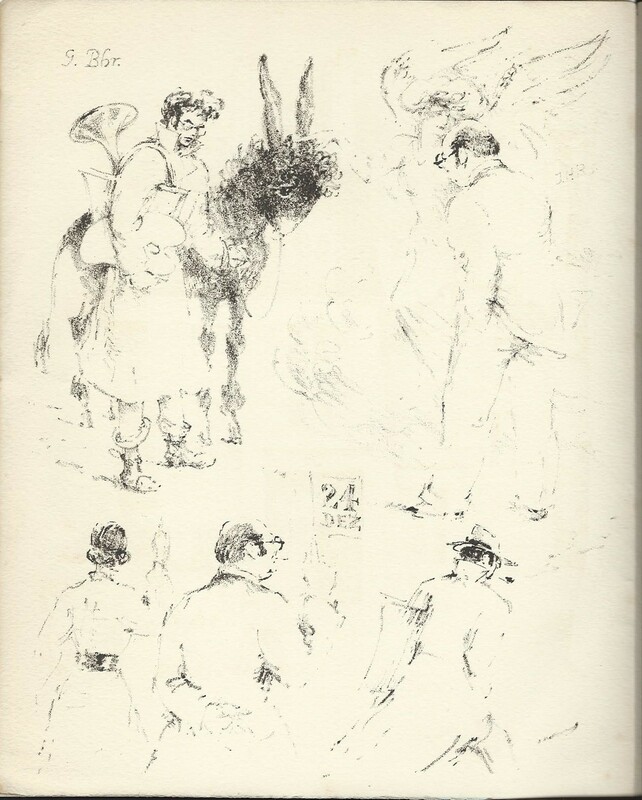 In 1934 he had provided illustrations for one Albatross book – the German language edition of Dickens’ ‘The life of our Lord’, and in the course of 1938, he had illustrated another – ‘Victoria Regina’ by Laurence Housman, a series of dramatised episodes in the life of Queen Victoria. He also worked on cover illustrations for an Albatross /Tauchnitz marketing brochure at the end of 1938. For the Christmas card, Böhmer seems to have been given free rein to produce something that not only glorified Holroyd-Reece as his patron, but extraordinarily featured a significant role for himself as the artist. 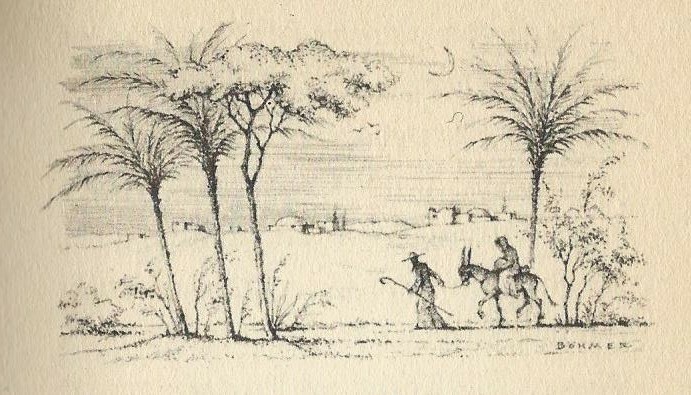 He appears on the very first page of the card, apparently arriving at Rue Chanoinesse with his sketchbook, palette and a hunting horn, accompanied by a donkey, to meet Holroyd-Reece and an angel. The symbolism of the card is not always easy to understand! 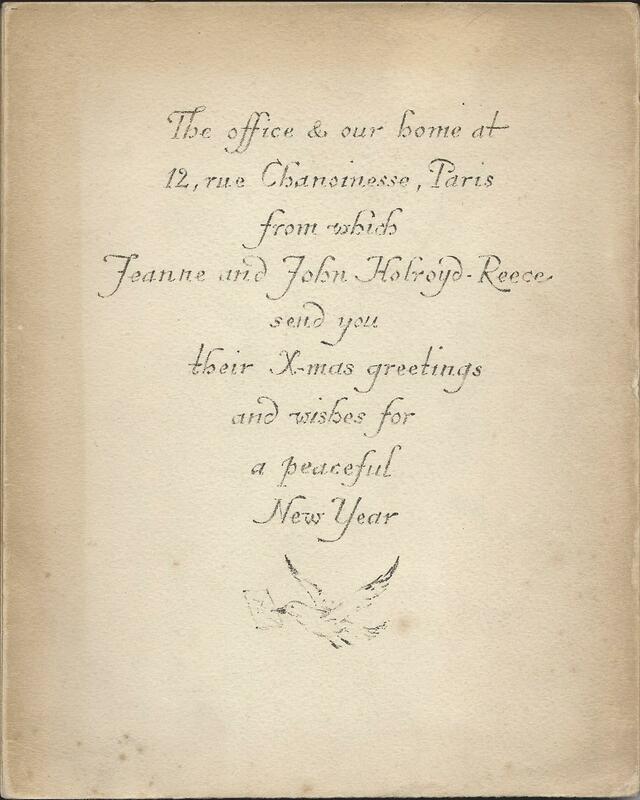 Throughout the rest of the card there are images of Holroyd-Reece and his wife in various settings, both in the office and in their private rooms, and also of various other Albatross staff working in the offices. Some of the staff can be identified by initials written alongside them – ‘WO’ for Wolfgang Ohlendorf, or ‘SB’ for Sonia Bessarab for example, but others are more mysterious. Böhmer with various Albatross staff. But why the unicorn horn? Perhaps most mysterious of all though is the near constant presence of the artist himself, who wanders in and out of the pages of the card, before again taking centre stage at the end. He’s shown saying goodbye to the Holroyd-Reece family outside the house, before departing past Notre Dame with his donkey, in a scene that seems to evoke Mary and Joseph. The final page shows him and his donkey relaxing together with the hunting horn after a hard day’s work. I can’t think of any other work of art produced for a wealthy patron, where the artist seems to have as large a role as the patron. 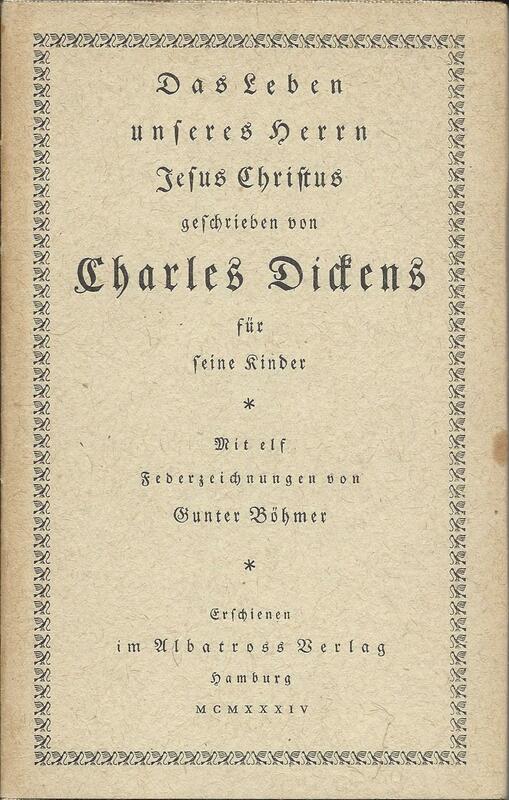 Charles Dickens more than any other author had helped to make the reputation of the Tauchnitz Editions in the 19th century. All of Dickens’ novels appeared in the Tauchnitz series and in some cases the Tauchnitz Editions are the true first printings in book form, printed from early proofs of the part-issues. There were also numerous volumes reprinted from the Dickens magazines, ‘Household Words’ and ‘All the Year Round’. The personal relationship between Charles Dickens and Bernhard Tauchnitz was very strong, as illustrated by the correspondence featured here a few weeks ago. But all that was in the 19th century and was ancient history by the time Albatross appeared on the scene in 1932 as the latest challenger to the long-established Tauchnitz. They recruited a large number of authors previously published by Tauchnitz, but they can hardly have imagined that Charles Dickens would be among them. 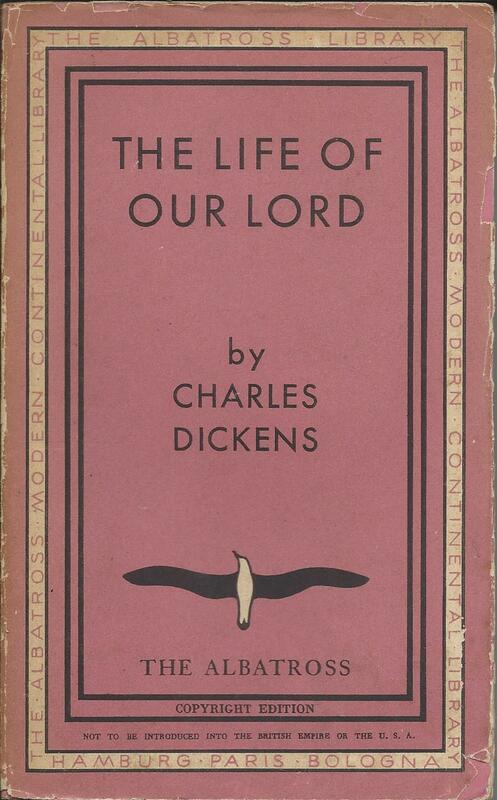 So it was something of a coup for them to obtain the right to publish Dickens’ version of the life of Jesus, written for his children, when it was released by his family in 1934. 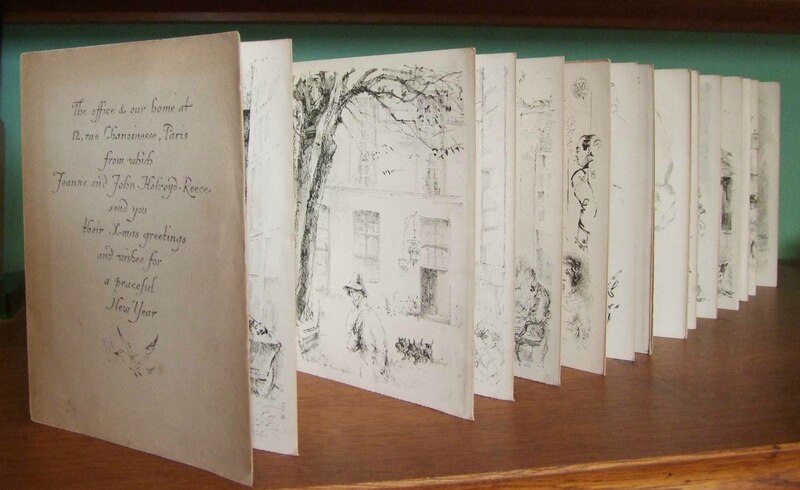 Dickens had not wanted it published, but after his death a handwritten version was passed down through his family, and continued to be read at Christmas. When publication was finally agreed, the rights were handled by Curtis Brown literary agents, who had played a role in the original creation of Albatross. In most cases the rights to continental publication could not be obtained for at least a year after first UK publication, but in this case the delay seems to have been waived and Albatross obtained the rights not only to publish an English language version in continental Europe (which appeared as Albatross volume 207), but also to publish a German language edition. By this point in 1934 Tauchnitz were close to collapse, and it is almost as if the loss of Dickens to Albatross was the final symbolic blow to their heart. Before the end of the year, Tauchnitz had been sold to the printing firm of Brandstetter and editorial control had passed to Albatross. The English language edition of the book was more or less a standard Albatross book. As the text is relatively short, it appeared in a large font size, and with wide margins, but still only stretched to 140 pages. The paper seems to be thicker than for most other Albatross books, presumably to bulk it out, but also of poor quality and subject to page browning. The German language version though is another matter, and seems to have been treated as a prestige publication. Unusually for Albatross, it’s a hardback book, written in Gothic Fraktur script, with illustrations at the heading of each chapter, and with a dustwrapper on heavier paper than normal. It was translated into German by Hans Mardersteig, who had been responsible as designer for the original design of the Albatross books when they launched in 1932, and the illustrations and book design were by Gunter Boehmer, a young German artist (then only 23) who was later to become much better known, and also to have other connections with Albatross. I’ll come back to those later, but there’s a brief preview here.